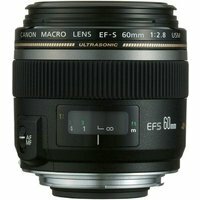 With its ability to focus life-size images onto the image sensor, the Canon EF-S 60mm f/2.8 Macro USM offers true macro performance in the EF-S lens series. The effective focal length is approximately 96mm in 35mm format, allowing it to produce breath-taking close-up results, and the minimum focusing distance of just 20cm gets you super close to your subject. The lens' near-silent Ultra Sonic Motor provides super-fast precision auto-focusing with full-time manual override.